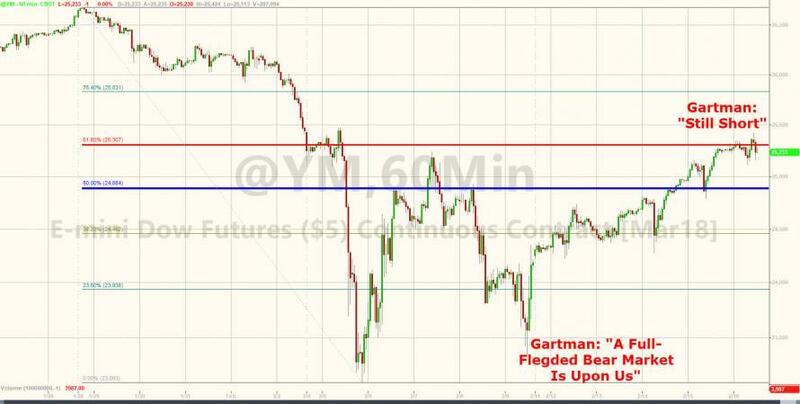 Gartman: "Still Short... But Ready To Admit We Are Wrong"
With US equity markets up between 5 and 10% since Dennis Gartman announced "a full-fledged bear market is upon us," he has reassured his newsletter-readers today that he is "still short" but has set a level 3% above today that will "signal he is wrong." Hence, two days ago… and if feels like a year already!... we sold the US, the Japanese and the European stock markets short and now that we have adopted this initial short position we have also adopted a point at which we admit that we are wrong and that shall be 3% above our entry point. Hence we are “short” of global stocks with our Index at 11,896 and we’ll admit error and run to cover should our Index “trade” above 12,253… another 100 “points” above where we stand presently. So when will Gartman turn bullish again - so that shorting can resume that is? The answer: not for a while. 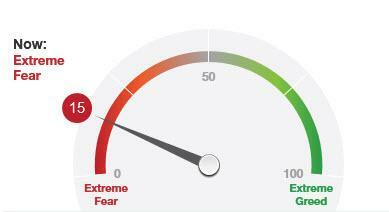 Finally we draw attention to the chart of the CNN Fear & Greed Index noting that having peaked several weeks ago when it very briefly touched 80 it has fallen to 8! This is as seriously over-sold as this index has become in the course of the past three years, only outdone when it fell to 2… yes 2!... back in the late summer of ’15. However, until such time as this index has clearly turned upward and is once again above 20 we shall refrain from turning bullish of equities.